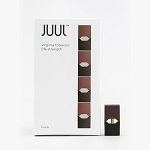 A must have for any serious vaper, Fresh Cut Tobacco Caps by Bo Vaping ensure you have a traditional and authentic tobacco flavored e-juice in your collection. Designed for use with the Bo one kit only each individual cap is prefilled with Fresh Cut Tobacco e-juice. For the traditionalist, it doesn't get better than the taste of pure, fresh tobacco, but with Bo Vaping's Fresh Cut Tobacco E-Liquid, you don't have to give up the thrill of a strong, aromatic tobacco hit, wood chip notes and all.